Is the NECA Alien that was released at Walmart the same as the version 2 release? Same question for the Genocide red and black warriors. Are the ones released later individually the same as the 2-pack versions? Yes on both accounts. Nothing different just the packaging. NECA just showed their Aliens/D.C. Crossover figures. Notice the newly sculpted hands and legs of the black alien. A first indirect look at alien resurrection warrior. Hmmmm, that Joker xenos might be worth picking up just for the laughs. Unreal that those silly hybrids are getting a figure all these years later. Maybe they'll do the hybrid from the Witchblade/Darkness series or the DotS hybrids next! Over all, I'm a tad underwhelmed by what we've seen. I'm gonna get the isolation xeno for sure, and I think the joker xeno is cool enough to get. Aliens wise though I'm not too impressed with Toy Fair this year. That might be because they have a whole assortment of Covenant figures that they aren't allowed to show, and that's where they've been putting their effort. NECA announces their NECA CLUB x ALIEN promotional incentive. Looks interesting. Forget it if you're outside the US. Gah. Oh, nice. That will be a big game changer for people outside the US. Hope they work it out. No fan should be left behind! 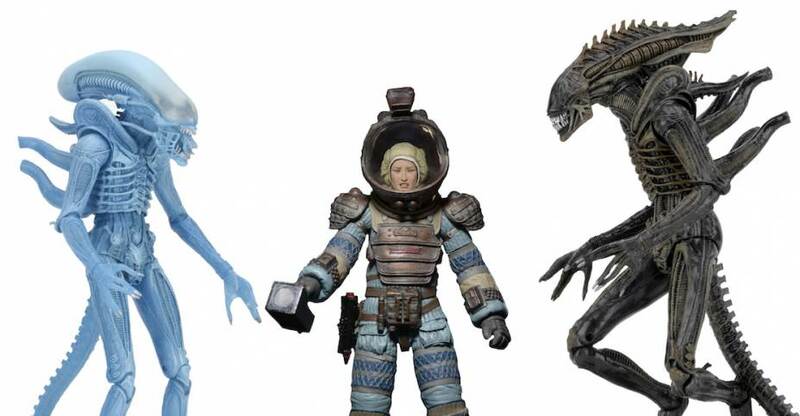 NECA have posted full details of ALIEN series 11 figures. My 2 minute impression of what I think of these upcoming figures is already posted on HIDEOUS PLASTIC.